# of employees: Three: Michael, Katie, and myself. 1. Name one thing that completely took you by surprise when you first started the shop - something that neither biz how-to books or any "SCORE" workshop prepared you for. I quickly realized how important it is to take a break, even if just a short one, when I’m feeling pushed to the limit. I’ve often found that when I give my mind that little bit of space away from the constant barrage of business related thoughts and responsibilities, I come back more refreshed and inspired, and then have the capacity to be far more productive than if I had kept pushing myself to work. Whether it’s a walk or drive, a little bit of time spent reading a book, whatever you like to do, letting your mind wander away from business, even in the middle of the work day, can really do wonders for productivity. 2. How long did it take you to set up the shop? Start from the day you said to yourself I'm opening a shop to the day your doors opened. The quick answer would be about a year, because I decided I wanted to open a shop in 2003, and did so in the winter of 2004. But the seed of Craftsbury Kids actually goes back to 1994 when I started my first business shortly after the birth of my first child. My little mail order catalog offered natural and organic baby products. Over the years it evolved into an online shop. In 2000 I closed it so that I could go back to school and finish my undergraduate degree. I kept the thought of someday opening another shop in the back of my mind. In 2003 I decided for certain that I would do so, although I didn’t yet know what my specialty would be. It was a toss-up between unusual hardware for the home (artist designed doorknobs, cabinet pulls, light fixtures etc.) 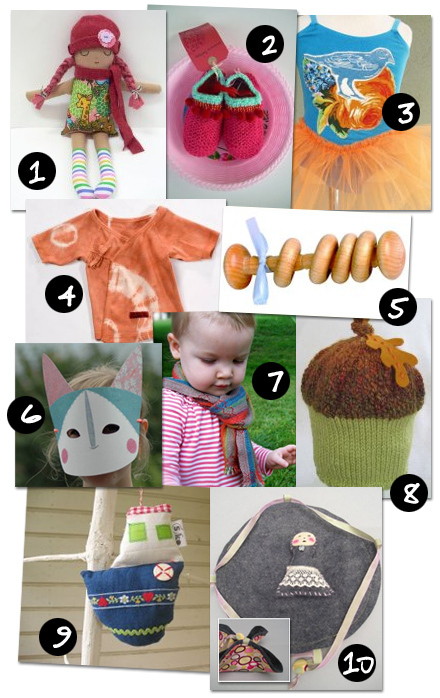 and handmade toys. I learned a lot during the six years spent running my first shop, and like to think that with Craftsbury Kids I picked up where I left off with the first one. 3. How did you come up with the name Craftsbury Kids? Can you share 3 other names that were close runner ups or ones that would have been disastrous in hindsight? I was inspired by a small town called Craftsbury in the Northeast Kingdom of Vermont. The name reminded me of old world quality and handmade objects. And the fact that I was planning to move to Craftsbury and run the shop from there further helped me to decide on the name. A close runner up was Craftsbury Toys. I decided against this one because I was finding that there was a lot of great handmade kid stuff out there, and didn’t want to limit my offerings to just toys. A couple others I considered were Maple Forest Toys and Love, Ceci. 4. Craftsbury Kids has received a good amount of press coverage since you opened. Do you have any marketing and promotion tips for aspiring and shop owners? I’d suggest choosing a niche and sticking with it, rather than trying to go too broad with your selection. Careful inventory choices will help your shop stand out to the press. I’ve found that sending short introductory emails about my shop to magazine editors and bloggers works well. I keep in touch with editors who’ve shown interest with occasional email updates, and joining social networks such as twitter has been a great way to keep them up to date as well. I would also recommend considering an affiliate program. Sharesale is a service that makes it very affordable to effectively reach potential customers with an affiliate program. And lastly, seek out authors on sites such as Squidoo. The articles or “lenses” put together on this particular network are highly targeted, and authors are often looking to recommend products that fit in with their content. 5. Can you please share 3 things you learned about buying and deciding how much inventory to purchase for the very first time. - Rather than trying to offer a large variety of categories early on, we focused on gift items. This allowed us to provide a rich variety in a focused area, and our shop didn’t look sparse. - Our first holiday season we reordered a number of things that were doing well, not realizing that the season had already peaked. This left us with lots of unsold inventory, and less operating budget for the months to come. This sort of thing can be difficult to judge, so it’s best to err on the side of caution. - Early on the “Just In Time” method worked best for us. We kept inventory lean. We learned that it was important to work with vendors who understood our needs, and were able to provide product in a timely manner. >> So you think your goods are perfect for Craftsbury Kids? 6. Do most of the other designers you carry approach you, or do you actively seek out new designers/crafters? If so, where? Early on we sought out new designers via blogs and various trade shows including the NY Gift Fair, and Toy Fair. These days we receive lots of submissions from designers and crafters interested in working with us, and also seek them out through Etsy, and various blogs. 7. What is your process in choosing merchandise and what 3 things can artists do to stand out in your mind? Don't undervalue your work... When an artist offers their product at the retail as well as wholesalelevel, it’s easier to work together if they can offer a true wholesale price (usually about half of suggested retail). If the artist is offering wholesale (or near wholesale) prices in their own retail shop, it is difficult for us to compete. However we can sometimes eliminate the conflict by asking an artist to create exclusive items for us. I seek out items that haven’t saturated the marketplace. If it hasn’t been done before, or the artist has put a brand new spin on something (i.e. it isn’t quite like anything else out there) that’s great. I gravitate toward merchandise that supports a child’s need for healthy play and self-expression, rather than items that prematurely push them into adulthood. - Familiarize yourself with the shop and determine whether your items are good fit. - Send clear pictures and a link to your website if you have one. Otherwise, a short blurb about yourself/your work. - When an artist offers their product at the retail as well as wholesale level, it’s easier to work together if they can offer a true wholesale price (usually about half of suggested retail). If the artist is offering wholesale (or near wholesale) prices in their own retail shop, it is difficult for us to compete. However we can sometimes eliminate the conflict by asking an artist to create exclusive items for us. 9. You've been in business since 2004 - was there a year where you felt some kind of sigh of relief and felt confident that you weren't going to be part of a statistic? They say that in the restaurant business, you shouldn't expect to see any profit until your second year - is it the same for retail in your experience? What should aspiring store owners be prepared to expect? That first year we were lucky to have some great press for the holidays, which resulted in strong sales, and this continues to be the trend. Even so, there was a huge learning curve regarding managing income. We weren’t prepared for the slow season that followed the holidays and we overspent on stock. So I would suggest preparing for these seasonal fluctuations ahead of time. Setting aside some revenue for slower times is a good idea. 10. As an online-only business, do you find it more and more challenging to compete with online giants like Etsy and DaWanda whose reach is forever growing? I think the overwhelming success of these large online marketplaces is proof that there’s a great demand for handmade wares. It’s been my experience that focusing on a niche is what sets businesses apart from each other, and the so called competition can actually provide inspiration to do new and exciting things. I like to ask myself: “What can I do that no one else has done before?” I’m excited by the diversity of shops out there and think they make for a more dynamic marketplace. 11. If Oprah decided to give you $10,000 tax free for your business, but you had to spend it in one week, what would you do with it? I’d use it to pay bills and advertise. A wonderful interview! I love Craftsbury Kids, and Cecilia had so many wonderful tidbits for us! I particulary liked the section on how an online artist/shop can "stand out." What a great selection and a wonderful shop! Am off to check out their online shop right now! Great interview! I like that the questions were very specific, and your answers gave lots of detail for the reader. Great links back to the shop, and I love the nooks you put together in the office! I have found that I need to spend time "sharpening the saw" in order to be at my peak, too--my fave is a novel from the New Releases section at the library that I picked up because it looks "interesting," kindof a little literary adventure since you never really know what you'll get! I had the pleasure of meeting Cecilia a few months ago and so it's especially fun to learn more about her and Craftsbury Kids in this fantastic interview. Thanks! What a lovely interview! I'm one of the lucky artists working with Ceci, and it is so nice to learn a little more about her.